I've forgotten where this info came from. Sorry! Edited by yours truly (contact me). The image came from Wikipedia. 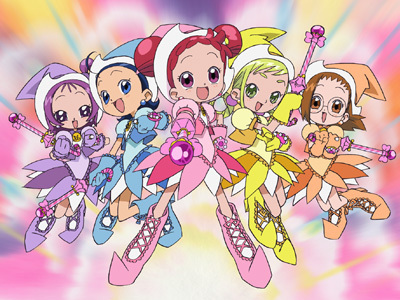 This is a series called Ojamajo Doremi Mo~tto. Ojamajo is a made up Japanese word and it stands for Ojama (Bothersome) Majo (Witch). The title itself is a pun to say that the main character is an Ojamajo. This is the sequel to Ojamajo Doremi #, which sequels Ojamajo Doremi. With this new series comes a new character named Momoko Asuka, and with Momoko comes a problem. Momoko is Japanese but has always lived in America and speaks only English. Momoko used to be the apprentice for another witch but she passed away and in her final moments gave Momoko an earring. Momoko refuses to take it off and when the teachers tells her to take it off she refuses and slaps the teacher. The only way the girls can communicate with Momoko is with there TWO new costumes. This season their shop is a pastry shop and the girls have pastry outfits (along with there witch outfits). On the pastry outfit is a head set that translates the two languages.